A few weeks ago I visited Lush Oxford Street and saw this huge bath bomb on the counter. It became an impulsive buy based on it's pretty colours and uplifting smell (plus I'm a sucker for anything limited edition). I later learnt that the profits from each and every one of these soft floral and liquorice-scented bath bombs will help fund equipment to satellite tag endangered hen harrier chicks born in the coming years. 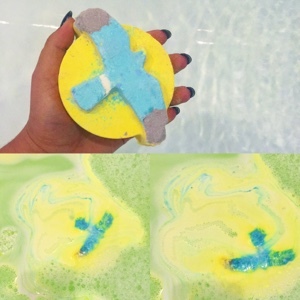 With bergamot, Sicilian lemon and cinnamon leaf oils, this bath bomb will take you under its wing and fight wildlife crime all in one clean sweep. I was mesmerised by the little blue bird that glided around my bath tub, and the slow fizz of this bomb meant the show went on long enough for me to both photograph and enjoy. You can read more about saving Britain's Hen Harriers here.